Outside Spaces – The spaces are not covered and do not include electricity, however one table is included. Please come to the office for rental payment and booth space assignment on Saturday or Sunday. Only one car is allowed for each rented space. Any additional vehicles must be parked in the general parking area. A parking space for each space is not guaranteed. These spaces are $10.00 and $14.00 per day. Covered Spaces – These spaces are approximately 10’ X 10’. Spaces are covered and include one table. Only one car is allowed for each rented space. Any additional vehicles must be parked in the general parking area. A parking space for each space is not guaranteed. These spaces are $14.00 per day located in our 300 Section. These spaces are approximately 10’ X 10’. Spaces are covered and include one table. Only one car is allowed for each rented space. Any additional vehicles must be parked in the general parking area. A parking space for each space is not guaranteed. These spaces must be paid in advance before setting up merchandise. A vendor has the right to reserve a space the week of by paying for both Saturday and Sunday. Once the space is rented, the vendor has the right to reserve the space by 4.00 p.m. on Sunday, for the following weekend. These are the only types of spaces that can be booked online. These spaces are $14.00 and $17.00 per day. If spaces are not reserved by Saturday or Sunday morning, spaces can be rented on a daily basis. These spaces are approximately 10’ X 12’. 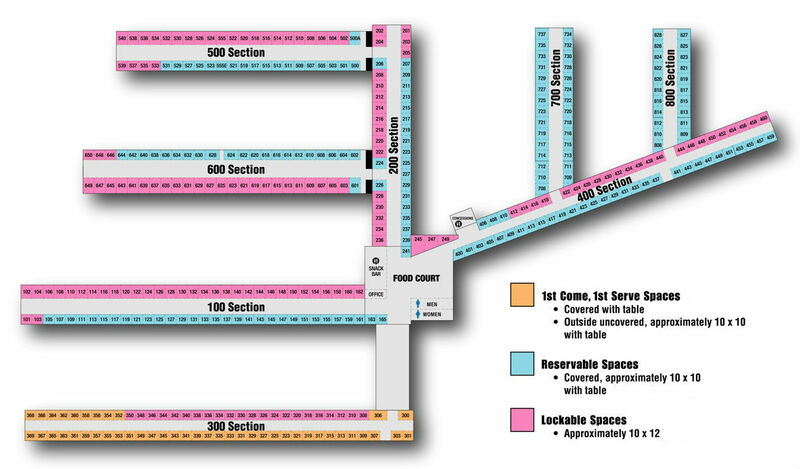 The lockables are intended for display cases, racks and non valuable merchandise. All items stored in lockable spaces are left at your own risk and the Lafayette Jockey Lot assumes no responsibility for lost or damaged items. Only one car is allowed for each rented space. Any additional vehicles must be parked in the general parking area. A parking space for each space is not guaranteed. These spaces are $44.00 per weekend. Dealers may enter Lafayette Jockey Lot Flea Market at 8:00am on Friday and may start setting up merchandise for the weekend. To occupy a 'First Come First Serve' table, merchandise must be set up and displayed in the space. Ropes, handmade signs and other ways of blocking off tables are not acceptable ways of reserving a 'First Come First Serve' space. The spaces must be paid for in advance. The sizes of the rental spaces listed above are approximate dimensions. Sizes may vary. Larger spaces may incur additional cost. Electrical outlets in spaces are for display lights and light duty electrical equipment only. NO CARDBOARD, NO PASTEBOARD, NO CORRUGATED BOXES OR OTHER LARGE ITEMS CAN BE DEPOSITED IN THE TRASHCANS OR DUMPSTER. ALL TRASH MUST BE PICKED UP INSIDE AND BEHIND YOUR SPACE OR THERE WILL BE $10 TRASH PICK UP FEE. All other policies and rules of the Lafayette Jockey Lot also apply to Lockable spaces. Please refer to Lafayette Jockey Lot Vendor Information Guidelines.